Nearly 700,000 candidates nation-wide sat Math tests this morning as part first phase university entrance exams. A report released by the Education and Training Ministry yesterday revealed that the number of registered candidates was around 220,000 less than on previous occasions. 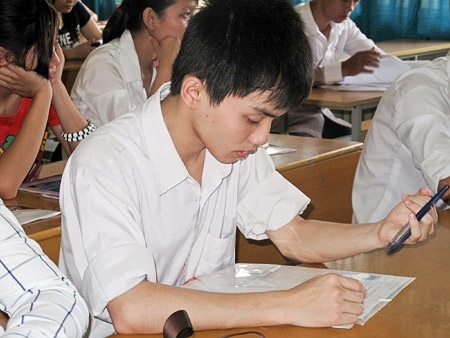 This year\'s university entrance exams are set to take place at nearly 1,000 destinations consisting of 25,500 testing rooms. Candidates are set to be tested on their 12th grade knowledge, according to Deputy Minister Bui Van Ga who added that, although the tests would not be overcomplicated, they would still sufficiently test candidate competence. As part of the first phase, candidates are also set to sit a Physics test this afternoon and a Chemistry test tomorrow morning. The second phase of entrance exams are set to take place next Saturday and Sunday while the final phase will be scheduled for the middle of July.